As the world’s first National Park, Yellowstone set the bar ridiculously high for the standard of beauty and adventure in our federally-protected lands. Set aside as protected land in 1872, Yellowstone was made to protect not only the huge number of geysers, thermal areas and hot springs, but also wildlife and stunning natural beauty. The creation of Yellowstone National Park is often called America’s best idea. Located in the northwestern corner of Wyoming and spilling out into the states of Idaho and Montana, Yellowstone is over two million acres in size and covers nearly 3,500 square miles. 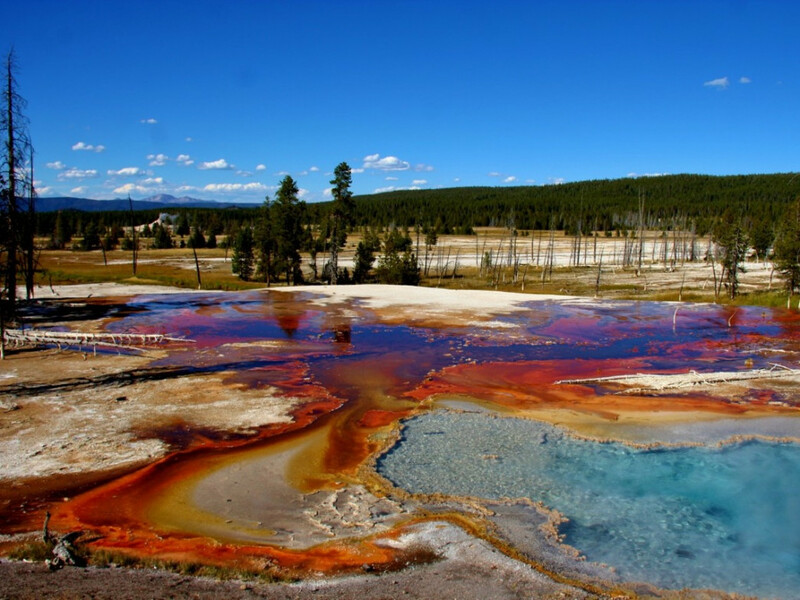 Yellowstone is more than just being the home to over 10,000 stunning and colorful hydrothermal features, 300 of the most incredible and powerful geysers and 290 waterfalls. It is also where 67 species of mammals roam freely, where 11,000' mountains stand tall over bison-filled prairies and where nature is truly wild and unrelenting. Visitors to the park get to see up-close and personal views of this region, thanks to five entrances, 466 miles of roads, 15 miles of boardwalks, lodges, seven campgrounds with 450 sites, and nine visitor centers and museums to further your understanding of this expansive section of the American west. Yellowstone’s backcountry is huge, offering over 1,000 miles of trails leading to 301 backcountry campsites in the deep wilderness of Yellowstone. This is where you go to be stunned by the power of the earth, amazed by the safari-like animal viewing, and awe-struck by the gorgeousness of nature. If you love destinations where you can spend a month and see something new every day, Yellowstone is the National Park for you. Starting at Gardiner, Montana, pass under the symbol of the National Parks: The Yellowstone Arch. Dedicated by President Theodore Roosevelt in 1903, the National Park creed “For the Benefit and Enjoyment of the People” is carved into this impressive entry point. For many, the arch is the where Yellowstone truly begins. Within a few minutes, you’ll be at Mammoth Hot Springs. Mammoth is the first of seven roadside thermal features of the park. While you can see the amazing features of Mammoth from the road, the 1.75 mile boardwalk trails get you close enough to the features to smell the sulfur in the air. Mammoth is a great introduction to the power of the geyser and hot springs area but keep in mind there is more to see. The Norris Geyser Basin is next, offering 2.25 miles of trails and home to the world’s tallest active geyser. 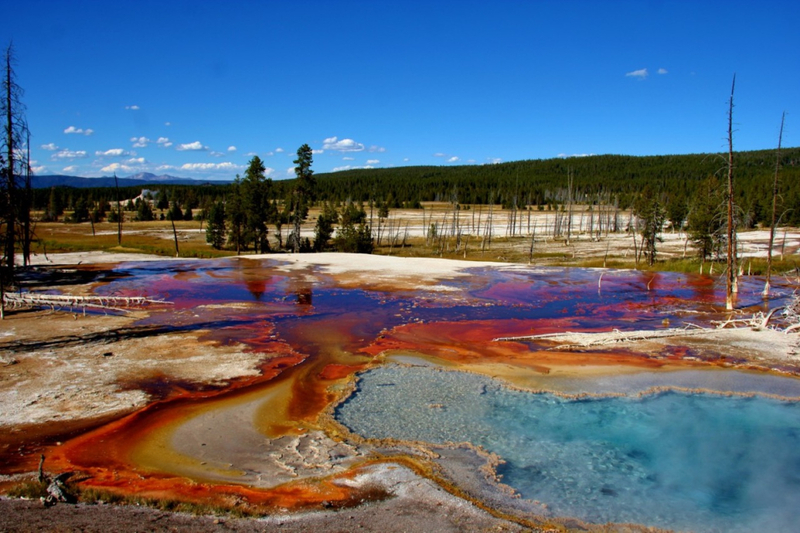 With numerous colorful hot springs full of vivid colors and the stench of sulfur (and steam rising from the ground as far as you can see), Norris is a fantastic place to fall in love with the geysers of Yellowstone. Further south, Lower and Midway Geyser Basins both are jaw-droppingly gorgeous. Midway gets you a spectacular view of Grand Prismatic Hot Springs, along with paint pots and other geothermal features. 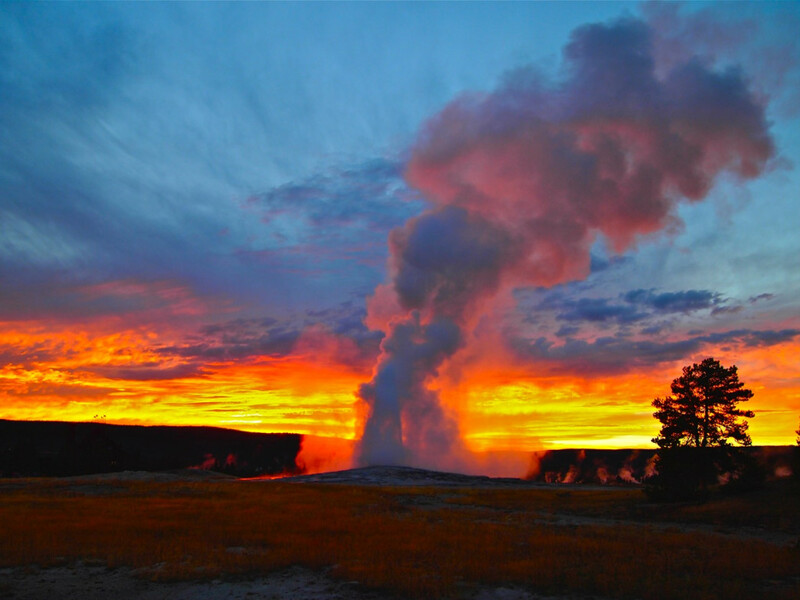 Upper Geyser Basin is beyond this area and the timeless classic of the Old Faithful region. After enjoying the geysers and hot springs, it is time to hike. With over 1,000 miles of trails, visitors of all levels will find amazing hikes all around Yellowstone. Some classic hikes are Uncle Tom’s Trail and the trails along the Grand Canyon of Yellowstone and the Fountain Paint Pots Trail near Madison. For stunning views, take the hike to the top of Elephant Back near Fishing Bridge or stand in awe while taking in the panoramic wonderland from the Mount Washburn Trail at the top of Dunraven Pass. Yellowstone isn’t just hiking and geysers. It is also where you can see some amazing waterfalls close to the main roads. 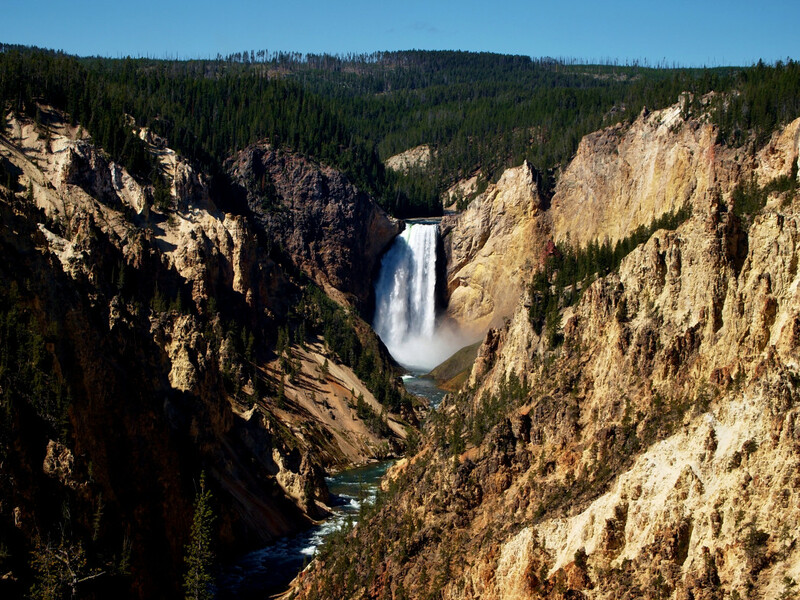 The most famous and must-see waterfall has to be located at the Grand Canyon of Yellowstone. Known as the Lower Falls, this is one of the iconic views in Yellowstone. Take in the full power and majesty of this region from Artist Point. Farther north, Tower Falls is yet another stunning waterfall that is accessible after a short hike. Lewis Falls near the south entrance and Undine Falls east of Mammoth are both beautiful roadside waterfalls that should be seen. Animal Watching is yet another highlight of America’s first National Park and is something you can easily do from the car or from pullouts through the park. 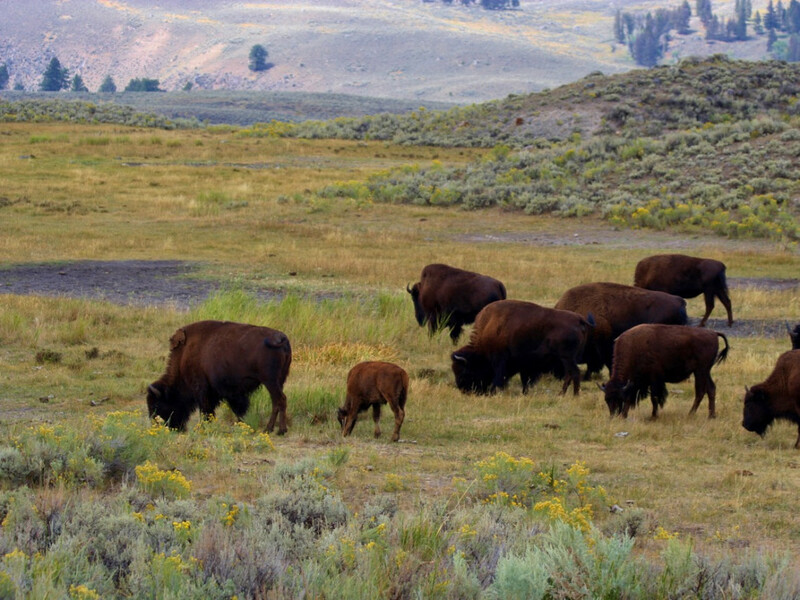 Throughout the entire park, bison and elk can be seen roaming the forests and valleys, with the larger herds of usually spotted in the northeastern region known as Lamar Valley. Lamar is also an amazing place to see wolves, bear, pronghorn, and nearly every other mammal in the park, including moose. Hayden Valley, in the middle of the park, is another fantastic place to see bison herds roaming and has recently become more popular for wolf activity. Elk often hang out toward West Yellowstone and Mammoth, where predators are less common. While the majority of your time in Yellowstone will be spent out in the beauty of the region, do not pass up the chance to take a tour and explore the history and beauty of the great lodges. Highlighted by the wooden cathedral known as the Old Faithful Lodge, these buildings blend perfectly with their surroundings and are just as iconic as the natural wonders of the park. Those looking for an amazing camping experience in areas active with animals need to head to Pebble Creek and the Slough Creek campsites near Lamar Valley. These first-come, first-serve campsites are the best places for stargazing at night, as well as a little bit of silence and solitude in the middle of wolf and bear country. It isn’t uncommon to hear packs of wolves howling in the distance as you cuddle up in your sleeping bag. Those looking to take a dip can choose between two awesome destinations. The first is a hot spring you can soak in, located just past the arch in Gardiner, Montana. As elk and bighorn sheep roam the cliffs around you, take some time out of your visit and enjoy soaking in the Yellowstone River. Near the South Entrance, swimming in Moose Falls lets you enjoy the wilderness of the forests of southern Yellowstone like nowhere else in the park. Next to a gorgeous waterfall, swim and play in the water during the heat of the day. For those looking for a truly western experience, head to the Roosevelt Lodge and take a horseback ride through the countryside. With options for an afternoon ride or a chuckwagon dinner out in the wilderness, this is an awesome way to watch bison roam while eating baked beans and listening to historical tales of the park. A perfect day in Yellowstone starts before sunrise, leaving your campsite or hotel room and heading toward the Lamar or Hayden Valleys. Here, as dawn or dusk approaches, the animals of the region become most active. Look for the masses of spotting scopes to watch wolves in the distance, or keep your eyes peeled as you cruise the road from Hayden Valley over Dunraven Pass and head into Lamar Valley for a glimpse of grizzlies, black bear and nearly every other animal in the park. Once you have completed your animal-watching safari, take time during the heat of the day to hit up the main features of the park. Watch Old Faithful, take a hike along the geyser basins, or explore the numerous lodges, enjoying these architectural masterpieces. For most, the best way to see the park is to drive the loop roads a few times during different times of the day. There are no wrong ways to explore Yellowstone, and the more you experience it, the more likely you will discover you favorite hike, pullout or tourist area. And for those who want a truly unique experience, remember that Yellowstone is open year round — and it is _spectacular _in the winter. Lodging options are whittles down to a few select locations but you can still witness the power of Old Faithful and the steamy geothermal pools, even when it's well below zero. Follow all posted signs, especially the ones about keeping your distance from wild animals. For the best wildlife viewing, wake up early and start looking for animals in the three main wildlife regions right after sunrise. Start again in the afternoon, about three hours before sunset. Watch your speed while driving, as animals can and will jump out in the road at any time. If you see a lot of cars stopped along the road, chances are they are seeing something amazing. Slow down or even stop and wait to see what they see. Go inside the lodges. They are architectural masterpieces that will leave you in awe. Plan on being busy from sun up to sun down if you want to see it all.